Guilt: God’s law shows me both the holiness of God’s character and that I have failed to meet his moral standards. This awareness (made possible through the Holy Spirit) then leads me to confession of sin and a desire for genuine repentance. Grace: the gospel (good news) then teaches me that Jesus Christ sided on the cross on my behalf to take away all my sins. This awareness leads to an understanding that God loves me and that he views me through the prism of Christ’s perfect righteousness. I therefore stand securely pardoned of my sin and righteous in the Lord’s presence. Gratitude: knowing that Christ has freely given me salvation that I don’t deserve and could never earn motivates me to live a life that reflects sincere gratitude to God for his grace. I then seek to please God with my life, not in order to earn or retain God’s love but instead because I already know God’s love and forgiveness in Christ Jesus. 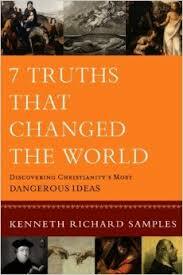 Kenneth Richard Samples, 7 Truths That Changed The World: Discovering Christianity’s Most Dangerous Ideas (Grand Rapids: Baker, 2012), 158. 4 truths I learned from brain surgery – the expert teacher.